Knesset votes 55 to 43 to approve Yisrael Beytenu chief as Defense Minister. 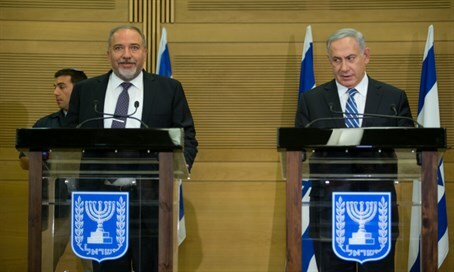 The Knesset voted on Monday to approve Avigdor Liberman’s appointment as Defense Minister. The Yisrael Beytenu chief was approved 55 to 43 in a Knesset vote that largely followed party lines. One member of the governing Likud party, however, abstained from the vote – Benny Begin. Yisrael Beytenu’s other ministerial appointment was also approved by the Knesset on Monday. Sofa Landver was approved as Minister of Aliyah – a position of particular importance for the Yisrael Beytenu party, which relies heavily on the support of immigrants from the former Soviet Union. A third appointment was also voted upon and approved by the Knesset Monday evening: Tzachi HaNegbi was approved as Minister in the Prime Minister’s Office. The three appointees were sworn in shortly after the Knesset vote. Former Tehiya MK and member of the Irgun and Lehi pre-state Jewish underground movements Geulah Cohen was present at the swearing in ceremony, much to the satisfaction of her son, Tzachi HaNegbi. Following his swearing in as Defense Minister, Avigdor Liberman gave up his Knesset seat, allowing the next member on the Yisrael Beytenu list, Yulia Malinovsky, to enter the Knesset.